How Cortex-Like Is the Hippocampus? The quantitative picture of cortical anatomy which we have sketched in Chapters 4 to 23 was based on measurements and observations limited to the dorsal hemisphere, i.e. to the part of the cortex roughly coinciding with the so-called isocortex. 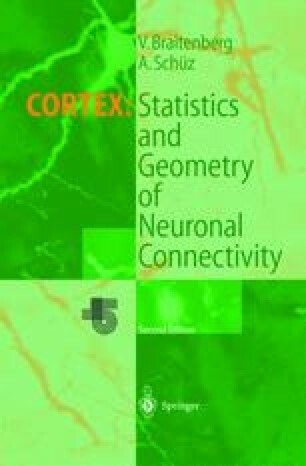 We have made no attempt at including the allocortex, although if we had done so, the general conclusions would have certainly remained the same and the quantitative statements would probably have changed very little. In particular, we did not try to stylize the general picture of the cortex in such a way as to include the hippo­campus, its most strikingly aberrant part, although we firmly believe that the hippocampus shares with the cortex not only the continuity of the network but also its most prominent features. The reason for our initial exclusion of the hippocampus is a sociological one rather than a matter of principle. The community of workers in this field has but little overlap with the one concerned with the cortex proper, and the connections to physiological questions lead to entirely different contexts in the two groups, to experimental animal psychology in one case and to cognitive studies in humans on the other. We did get involved in the hippocampus, however, when we were drawn accidentally into a meeting on the hippo­campus, and the result was a paper (Braitenberg and Schüz, 1983) which we summarize briefly here.